Home › Income › What Do You Do When You Get Your Income Tax Audited? You get a letter in the mail, a letter inscribed with the gut-wrenching acronym: LHDN (The Inland Revenue Board of Malaysia). “But I paid all my taxes and I filed in on time!” you exclaim. That may be the case, but unfortunately, that doesn’t mean you won’t get audited. A tax audit is an examination of tax return by the LHDN to examine your tax return a little more closely and verify that your income and deductions are accurate. There are two types of tax audits: desk audit and field audit. A desk audit involves simpler issues or tax adjustments that can be dealt with via correspondence at the LHDN office. It generally involves checking all information on income and expenses, as well as various types of claim made by a taxpayer in his income tax returns. A field audit is more complicated. It typically takes place at a taxpayer’s premise and involves the examination of all the taxpayer’s business records through a tax agent or officer. In the case of a sole-proprietorship or partnership, if the taxpayer’s business records are incomplete it may involve the examination of non-business records such as personal bank statements and other assets. A taxpayer will be given notice prior to a field audit. The time required to complete an on-site examination could span between one and three days. However, the audit timeframe may be extended depending on the size of the business and complexity of business transactions. Both types of audits are aimed at encouraging voluntary compliance with the tax laws and regulations, and to ensure that a higher tax compliance rate is achieved under the Self-Assessment System. Why am I selected for an audit? 4) Based on specific issues affecting a certain group of taxpayers or based on specific issues surrounding a geographic location. The first thing to do would be to keep calm and let the auditor do their job. Depending on the reason and rationale for the audit, the taxpayer will be required to provide relevant information pertaining to the issue at hand. If there are tax adjustments to be made, the taxpayer will receive a notification with details of proposed tax adjustments and the rationale for making such adjustments. The taxpayer will be given 21 days from the date of notification of proposed tax adjustments to state his views on the findings or to file an official objection if he agrees. Additional information and copies of evidence should be provided to support this objection. This is why we should always keep our records like receipts and invoices for seven years, as LHDN has the right to audit your tax file from as far back as seven years. If no objection is made within the 21 days or if an objection is found to have no basis, the taxpayer shall be deemed to have agreed to the proposed tax adjustments and will be required to take action accordingly. In an audit, a taxpayer can request for his or her tax agent to be present during an interview. A taxpayer who is not conversant in Bahasa Malaysia or English is allowed to bring in an interpreter. If a taxpayer appoints a new tax agent to handle his or her audit case, he or she will need to submit a copy of the letter of appointment. First things first, do not obstruct or hinder the audit officer from performing his duties. Failure to cooperate with an audit officer is an offence. Obstructions include refusing an audit officer from entering lands, buildings, places and premises to perform his duties. Refusal or purposely delaying the provision of relevant books of accounts or other documents that are required by the audit officer, or failure to provide reasonable responses to questions raised or assistance to the officer in carrying out his duties could also land you in hot soup. Taxpayers are also prohibited from giving any form of gifts and transacting any business with the audit officer during the auditing process. If you can prove that your initial return was complete and accurate, you will not be questioned further. But if they find errors or purposeful misreporting in your filings, you will either be fined with a penalty or imprisonment, or both, depending on the severity or the number of offences. 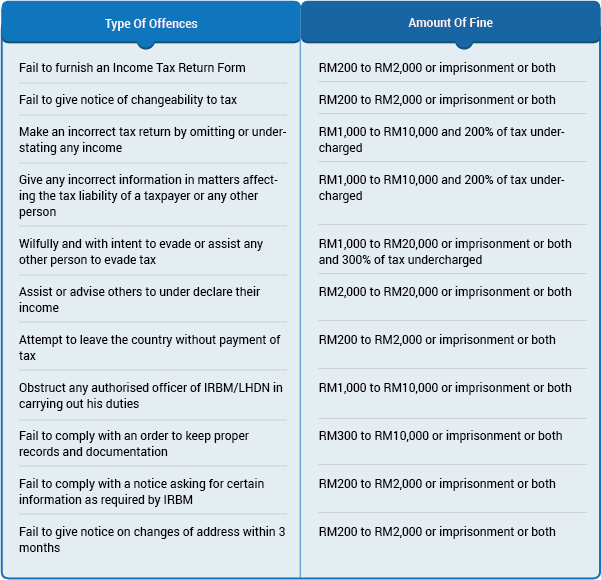 The following table illustrates briefly the fines and penalties for different types of offence. The complete list of offences, fines and penalties can be found here. To avoid trouble, taxpayers are required to keep all sources of records, documents and working sheets for seven years (calculated starting from the end of the year in which the Income Tax Return Form is filed) as evidence and reference if required by an audit. We often hear stories of people who’d successfully evaded taxes for years, but it is only a matter of time before the authorities catch up and force these evaders to face the music. The LHDN has intensified its field audit activities in recent years, resulting in significant additional taxes and penalties being imposed. In 2012, LHDN managed to solve nearly 1.9 million tax evasion cases to recoup an additional RM2.94 billion in revenue. This year, LHDN and the Finance Ministry is confident that direct tax collection will reach RM142.646 billion (compared to last year’s collection of RM133.694 billion) despite external challenges such as falling oil prices and the implementation of the Goods and Services Tax (GST) in April. However, the implementation of GST is expected to reduce income tax collection by an estimated RM6.12 billion. With your taxes filed accurately and completely, you won’t have a problem building your wealth through the purchase of assets such as properties and cars. To avoid financial and legal implications, it is important for all taxpayers to ensure their taxes are paid on time and accurately. Nobody enjoys filing for taxes, but a little planning can make the process a whole lot less “taxing”.